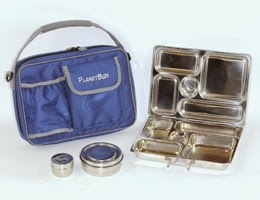 In this bento lunch (packed in a Planetbox rover): A sandwich with a Pikachu of mild cheddar cheese using a large circle cutter. The nori mouth was freehand cut as were the tops of the ears, and the nose was made with a heart shaped puncher. Nori and Provolone cut with round cookie cutters made the eyes, and another round cutter was used to make the blushing cheeks. 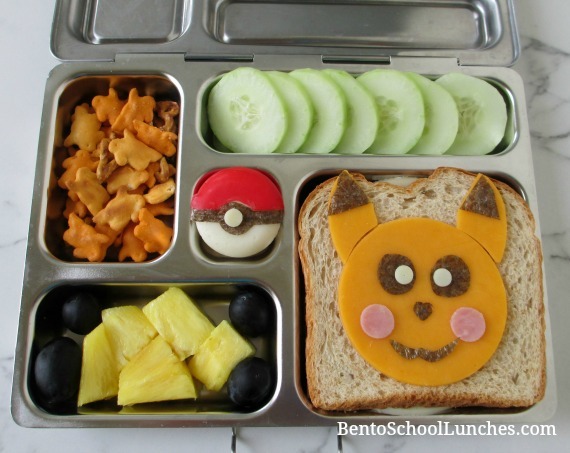 Above Pikachu are cucumber slices and to the left of them are Annie's organic snacks. To the left of Pikachu are some grapes and chunks of pineapple. In the middle of it is a Poké Ball of Babybel cheese, small round provolone and nori. This lunch is so cute!! I've made pokeball cupcakes for a party and the kids loved them!